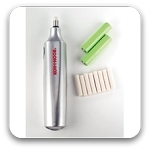 Specially designed for erasing on drafting film and vellum without smudges. PVC material. Latex-free. For removing pencil lines.